Jared Unzipped: The Terror of Count Duckula! Hunting and stalking at night with a taste for... vegetables? Any proper child of the '80s will remember the awesomeness that was Count Duckula. It was a cartoon that featured a vampire duck and his various monstrous companions. Within the narrative of the cartoon, Count Duckula would be reincarnated about ounce every century. Though, there was a slight mishap with the current version. The summoning ritual which brought him back to life accidentally substituted ketchup instead of blood. Oh, the horror! Now, instead of sucking blood from his victims, Count Duckula scarfs down carrots and broccoli sandwiches. Using his magical teleporting Castle Duckula, the Count can transport to any place (or time) on the planet, often with hilarious results. Yet, at the crack of dawn, Eastern Transylvanian Standard Time, the castle automatically returns to Transylvania. Count Duckula was originally broadcast from 1988 to 1993. I can remember watching it on Nickelodeon as a kid. It has a very memorable intro song (as heard above). 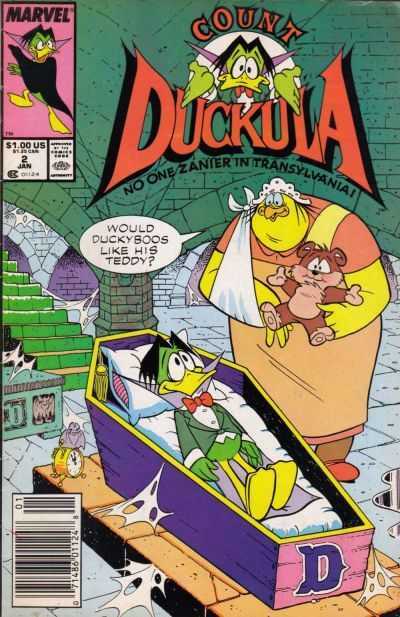 I also remember how macabre the content was for a cartoon about a friendly vampire duck. 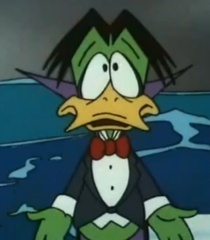 As an adult, I learned that Count Duckula was in fact a British cartoon produced for the ITV network, with Nickelodeon merely picking up the American broadcast license. Here's a batch of classic Nickelodeon commercials. Jump to the 2:39 mark for Count Duckula! Count Duckula was broadcast during the golden era of Nickelodeon. It shared the airwaves with other classics like Clarissa Explains It All, Are You Afraid of the Dark? and Double Dare! For a horror cartoon, it was just scary enough to make you sit on the edge of your seat, only to find yourself laughing at how stupid the Count actually was. Besides having a cartoon, Count Duckula received a series of comics from Marvel and a video game for the Commodore 64. Though the goofy Count hasn't been heard of since his show ended, I hope he'll perhaps make a return someday. Maybe he's still rolling around Transylvania, stealing artichoke hearts and making a grand old fool of himself. And now, enjoy a full episode of Count Duckula!